At the moment ships are prohibited from dumping plastic overboard but there's no international law against plastics flooding into the sea from the land. Plastic pollution doesn't recognise international borders. Delegates in Nairobi preparing the way for the UN's environment ministers meeting next week are said to be in broad agreement on the need for tougher action to combat the plastics crisis. Norway also favours attempts to clear up "ghost" fishing gear discarded in the seas. Norway wants governments to compile an assessment of exactly how much waste plastic is getting into the sea from their territory. It admits this won't be easy. A source close to the talks told BBC News: "There are many questions to be solved. 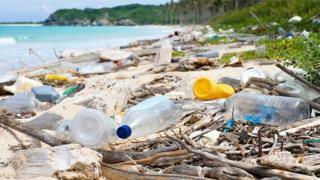 Should there be a legally binding instrument prohibiting plastic from the land? "If not, what other sort of overarching action should there be? We are grappling with this huge issue in its early stages." China - the world's biggest plastics polluter - is said to be cautious about being bound by global rules. India's Prime Minister Narendra Modi recently applauded the clean-up of plastic from a beach in Mumbai, saying: "It is our duty to protect the environment for our future generations." Eirik Lindebjerg from WWF said the Nairobi meeting could prove a turning point in the plastics crisis. He told BBC News: "The treaties on climate change and biodiversity were initiated in this forum - so it has a track record of making things happen. "Plastics is one of those issues that clearly needs global agreement with maybe eight million tonnes ending up in the ocean. "Plastic flows are huge and damaging; they flow across borders. We absolutely have to stop allowing plastics into the ocean - and this meeting looks like it could prove a very important start."